An Acoustic Microscope (Ultrasonic Microscope) is based on the same working principle as the well known medical ultrasonic examinations: A probe is moved (within a coupling fluid)across the area of interest. An image comes up showing the interior without violating the "object" under investigation. The heart of the Acoustic Microscope is the probe (=Transducer; loudspeaker and microphone in one piece). It converts the electrical signal into the acoustic signal. The sound waves are focussed and transmitted to the sample by the coupling fluid (normally water). The ultrasonic waves interact with the sample; one part is reflected back to the transducer, the other part is transmitted. Basically there are 2 methods of ultrasonic imaging: In the majority of cases the "Pulse-Echo"-Mode is used. Amplitude, phase and time of flight of the reflected soundwave are analysied to create the pixel-by-pixel image information. This mode operates with one transducer. The couterpart of this mode is the "Transmission Mode" (=Throgh Scan Mode). In this process a second transducer underneath the sample receives the transmitted part of the soundwaves. This transmitted signal is the base for the acoustiv throgh scan image. At both methodes (Puls-Echo- and Transmission- Mode) the inspected sample is scanned pixel by pixel and line by line. The movement of the transducer is realised by a x-y-mechanic, the so called Scanner. The time of a sample inspection is depending on the size of the sample and the chosen resolution and can last a few seconds till several minutes. The features of the transducer (frequence and focal length)must be aligned with the application. For this reason there are a huge number of transducers; comparable to the multiplicity of objects used for high quality cameras. To choose the right Transducer some things have to be regarded: Transducers with high frequence and short focal length produce a high resolution in comparison with the penetration depth. 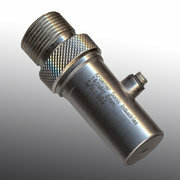 The choice of the correct Transducer for the respective application is very important. An agreement between favoured resolution and penetration depth have to be found. How are contrasts created in an acoustic image? Ultra sonic waves need instead of light a propagation medium. The higher the mediums density the better sonic waves can expand. This can also be recognized in everyday life: in air (comparatevely "light" medium) ultrasonic waves can expand slow and not so far. For example: loud music in a building can be heard only 2-3 rooms further. Dense materials carried sound much better. 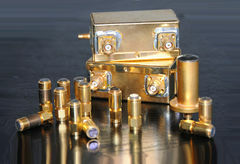 For example: metal pipes carry sound excellent; the heaters at the end of a pipe attend to "loud speakers". 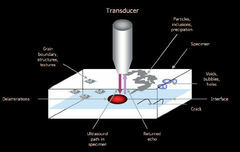 Sonic acoustic microscopy make use of the physical circumstances. 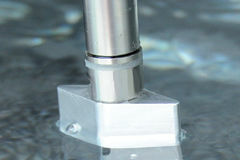 After leaving the transducer the ultrasonic waves are transported by the couple medium (generaly water) to the sample. Inside the sample it strikes a lot of different materials and fringe areas that affect the amplitude, the phase and the elapsed time of the ultrasonic signal. The evaluation unit of the sonic acoustic microscope recognized these partly lowest changes and creates an image out of this inforamtions. In summary: ultrasonic waves react very sensitive to changes and inhomogeneity of the medium it moves in. Primarily differences in density and elasticity are mentioned. Affordable Price One key imaging function Automatic adjustment function: electron gun heat..
Open-type electron gun, user-friendly replacement of the filament; with a new electrical control sys.. The Phenom Pure desktop scanning electron microscope (SEM) is an ideal tool for the transition from ..